Zurich, April 11: Scot tennis star Andy Murray returned to action after a month-long injury lay-off in a charity exhibition match against Swiss legend Roger Federer. 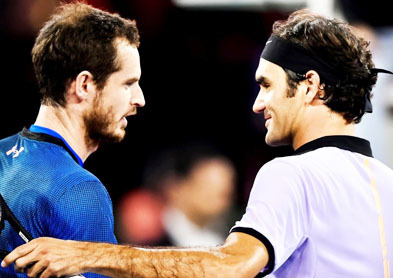 The 35-year-old Federer dominated the game — named “Match for Africa 3” — against the current World No.1 from Scotland, winning 6-3, 7-6 (7-5) here on Monday. The game was organised by the Roger Federer Foundation, which manages several projects in Africa. Murray has been out of action since his surprise second-round defeat at the BNP Paribas Open early last month due to an elbow injury. The 29-year-old is expected to return to competitive tennis at the Monte Carlo Masters next week. “I’m hoping, if I keep progressing as I have with the elbow, to play Monte Carlo,” Murray was quoted as saying by the BBC. Earlier on Monday, Federer and Murray trained on a raft floating on the Limmat river here to promote the “Match for Africa 3” and to raise money for African children, reports Efe. During the raft training, Federer and Murray, who dressed in casual gear, had to hit the ball gently to prevent it from falling into the water. Founded in 2003, the Roger Federer Foundation supports educational projects located in the region of southern Africa and Switzerland. The programmes on the African continent focus on the improvement of the quality of early learning and basic education.